At a later press conference in Hamburg, where the G20 summit was held, Russian President Vladimir Putin said he believed there was a chance for restoring the badly frayed US-Russia relations. He praised Trump for being thoughtful and rational. “The TV Trump is quite different from the real life one,” quipped Putin. Meanwhile, the White House issued a statement hailing the two-hour discussion (four times longer than originally scheduled) between the two leaders as a good start to working together on major world problems. “No problems were solved. Nobody expected any problems to be solved in that meeting. But it was a beginning of a dialogue on some tough problem sets that we’ll begin now to work on together,” said HR McMaster, Trump’s top national security adviser. Trump deserves credit for the way he conducted himself. He met Putin on equal terms and with respect. “It’s an honor to meet you,” said the American president as he extended a handshake. The much-anticipated encounter comes nearly seven months after Trump was inaugurated in the White House. Over that period, large sections of the US media have run an unrelenting campaign accusing Trump of being a Russian stooge and alleging that Putin ordered an interference operation in last year’s US election to benefit Trump. Apart from innuendo and anonymous US intelligence claims, recycled endlessly by dutiful news organizations, there is no evidence of either Trump-Russia collusion or Putin-sanctioned cyber hacking. Trump has dismissed the claims as “fake news”, while Moscow has consistently rejected the allegations as baseless Russophobia. Against this toxic background of anti-Russian propaganda, President Trump met Putin at the weekend. The two men were due to talk face-to-face for 30 minutes. As it turned out, their discussions went on for two hours. They reportedly exchanged views on pressing matters of Syria, Ukraine and North Korea among other things. 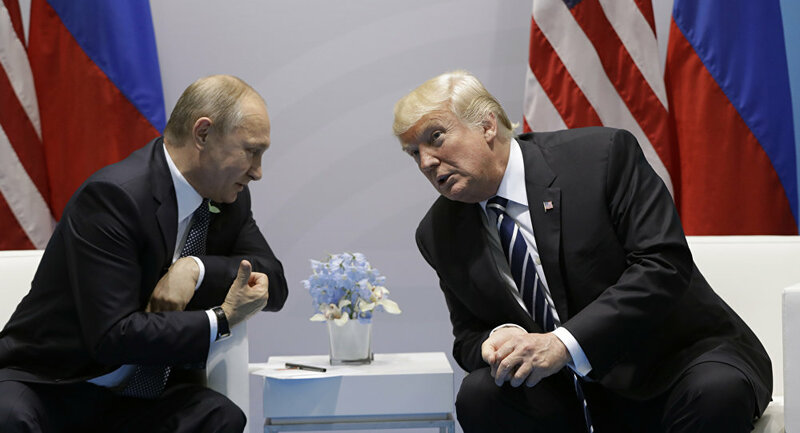 Trump brought up the issue of alleged Russian meddling in the US elections, and Putin responded in detail to assure his American counterpart it was a fabricated brouhaha in which Russia had nothing to do with it. Only days before the big meeting, US media editorialists and pundits were warning Trump to confront Putin in an aggressive manner. The Washington Post, one of the leading anti-Russia voices, exhorted Trump to rap Putin on “US election meddling” as if the claim was a proven fact. It also urged the president to give notice to Putin that Russia had to accede to regime change in Syria. It was a get-tough order. To his credit, Trump did not allow the Russophobia in the US media to influence his manner with Putin. He was cordial, respectful and open to listening to the Russian viewpoint on a range of issues. So much so that it appears both leaders have agreed to work together going forward. The question now is: what next? Trump and Putin have evidently got off to a good start despite the inordinate delay and toxic background. But what does Trump’s willingness to engage positively with Moscow actually mean in practice? The US Deep State comprising the military-intelligence nexus and their political, media machine in Washington does not want to normalize relations with Russia. Russian independence as a powerful foreign state under President Putin is a problem that rankles US global ambitions. That’s why the Deep State wanted anti-Russia hawk Hillary Clinton to win the election. Trump’s victory upset their calculations. Under immense pressure, Trump has at times appeared to buckle to the US political establishment with regard to projecting hostility towards Russia, as seen in the prosecution of the covert war in Syria and renewed sanctions on Moscow. The day before he met Putin in Germany, Trump was in Poland where he delivered a barnstorming speech in Warsaw in which he accused Russia of “destabilizing countries”, among other topics. The American president also inferred that Russia was undermining “Western civilization”. It was provocative speech bordering on hackneyed Russophobia. It did not bode well for his imminent meeting with Putin. A clash seemed to be coming, just as the US media had been cajoling. However, the meeting the next day with Putin was surprisingly congenial. And the substance of discussions indicates a genuine desire from both sides to cooperate. It is good that both presidents have struck up a rapport and personal understanding. Nevertheless, it is important to not bank too much on that. Immediately following the constructive meeting between the leaders, the US media started cranking up the Russophobia again. The US media are vents for Deep State hostility towards Trump and his agenda for normalizing relations with Moscow. The New York Times reported another breathless story about Trump’s election campaign having contact with “Kremlin-connected” people. CNN ran opinion pieces on how the president had fallen into a trap laid by Putin. It is hard to stomach this outlandish confabulation that passes for journalism. And it is astounding that a friendly meeting between leaders of nuclear powers should not be received as a good development. But it shows that Trump his up against very powerful deep forces within the US establishment who do not want a normalization with Russia. The US Deep State depends on confrontation, war and endless militarism for its existence. It also wants a world populated by vassals over which US corporations have suzerainty. An independent Russia or China or any other foreign power cannot be tolerated because that upends American ambitions for unipolar hegemony. Trump’s encounter with Putin was commendable because he did not succumb to toxic Russophobia and adopt a stupid, mindless tough-guy posture. Instead, Trump reached out to Putin in a genuine way, as two human beings should do. The US Deep State is not about humanity or understanding. It is about maintaining perceived dominance over other humans, where anyone seen to be an obstacle is disposed of in the most ruthless way. President John F Kennedy was assassinated in broad daylight by the US Deep State because he dared to seek a normalization and peaceful coexistence with Moscow. The Deep State does not want normalization or peace with Russia or anyone else for that matter because there are too many lucrative vested interests in maintaining the war machine that is American capitalism. This is not to predict a violent demise for Trump. The Deep State has other methods, such as the orchestration of media and other dirty tricks. Trump’s friendly overtures to Russia are at least a promising sign. But given the power structure of the US, and its incorrigible belligerence, it is doubtful that Trump will be allowed to go beyond promises. If he attempts to, we can expect the dark forces to step up. What needs to change is the US power structure through a democratic revolt. Until that happens, any president in the White House is simply a hostage to the dark forces of the Deep State.